Have you ever heard someone in L.A. complain that they’re bored? Nothing to do? No good ideas? Well, enter our list of 40 fun (and free!) things to do in Los Angeles. There might be 40 on this list, but with all the variations and permutations of different aspects of the same activities, really we’re talking about literally hundreds of things to do. They’re all free (save transportation, and occasionally parking). They’re all in Los Angeles. And we absolutely dare you to do all of them. I’ll skip the rest of this introduction, sufficed to say, if you DO manage to complete this entire list, you’ll have my undying envy and admiration. Or, at very the least, I’ll send you a smiley face tweet on Twitter. There are literally dozens of free museums and museum days for you to explore when you’re in Los Angeles. From LACMA to the Huntington Gardens to MOCA or the Norton Simon. If you can’t find at least one that suits your tastes, you aren’t even trying! Looking for a bit of adventure? 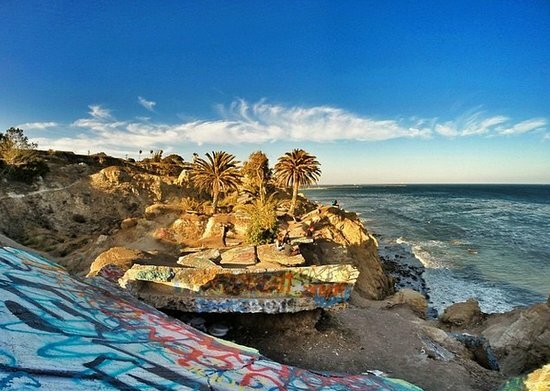 Go check out an old neighborhood that literally fell over the side of a cliff on the California coast at the Sunken City in San Pedro. EDITOR’S NOTE: Since the original publication of this piece it’s come to our attention that the police are ramping up efforts to dissuade visitors from checking out the Sunken City, including sealing up an access hole under a chain linked fence with concrete, so at this time we do not recommend you visit the Sunken City and remind you it is trespassing on private property. A neighborhood gem in the heart of Silver Lake. Drive by during evening hours to see this incredible tree light up the night. You can get there via Bronson Canyon like we did, or take one several other routes. But trekking up to the top of the sign is something every Angeleno should do at least once. Get an incredible free view of downtown Los Angeles by going up to the observation deck on the 27th floor of City Hall. Even if you don’t partake in the food at Grand Central Market (and you should! ), just wandering around and admiring the vibrancy and variety will be an enjoyable experience. A curated collection of seasonal musical performances in downtown Los Angeles. And totally free! A dark room inside a senior center in the heart of Santa Monica offers an artistic projection of the world that surrounds. If you’re in the neighborhood, definitely be sure to stop by the Camera Obscura. Every second Thursday of the month see downtown Los Angeles come alive in a vibrant blend of art, community, culture and food known as the DTLA Art Walk. The park and exterior garden of the Greystone Mansion is one of the most gorgeous and peaceful spots in the entire city (and on a side note, a pretty incredible wedding/event location too). Free monthly screenings at the Downtown Independent of short “pilots” that live or die based on audience approval. Go to the Echo Park Lake to have a picnic, set up shop by the and enjoy a stellar view of palm trees framing the DTA skyline, along of course with the wonderful weather. And of course don’t forget the Lotus Festival every summer! When you’re seeking a little peace and serenity in your life, take a walk inside the Peace Awareness Labyrinth, a hidden gem tucked away in the heart of the middle of Los Angeles. 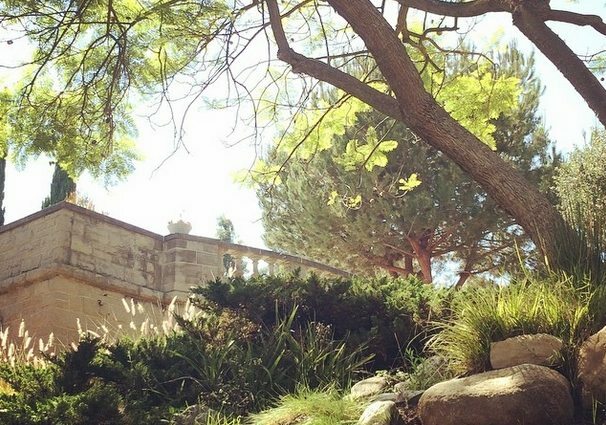 Explore the ruins of the zoo before the zoo in the middle of Griffith Park. For more info, Tom Explores Los Angeles does a great piece on this place (we embedded below). A massive gallery on Santa Monica Blvd. that features an amazing stable of artists on exhibit. Get more info about Regen via their Yelp page. A stretch of road along Van Nuys Blvd. in the community of Pacoima boasts some of the best mural artwork in the entire city. It’s known as Mural Mile. 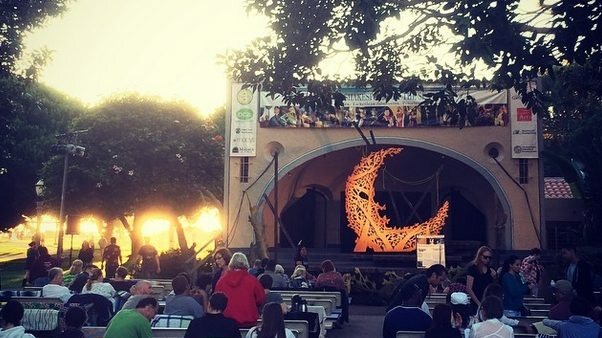 If theater is your thing, every summer there are free performances of Shakespeare by the Sea and Shakespeare at the Park that make for a perfect evening of picnicking and culture. An outdoor amphitheater in Old Town Pasadena that has an amazing run of free performances over the course of every summer. Check out 2014’s calendar to get an idea of what you might see. The Jet Propulsion Laboratory (or JPL) is a federally funded research and development center and NASA field center located in La Cañada Flintridge, just northwest of Pasadena. JPL does an open house once a year in October with free admission to the public. The open house includes an insider’s view in their machine shop, the microdevices lab, lifesize 3-D models, and more! They also have a weekly lecture series that takes place twice a month on consecutive days with industry experts discussing relevant topics to the space and technology field. The lecture series is also free! 2014’s open house takes place October 11th and 12th. There are countless amazing spots around the city where you can get an amazing view, whether you’re looking for a peaceful ocean scene or a great photo-op of the DTLA skyline. To get started, check out our compilation of free viewing points. Hike a trail to locate the ruins of an abandoned Nazi sympathizer compound built in the Pacific Palisades in the 1930’s. One of the most unique architectural interiors in the entire city. As a visitor you can only go up to the second floor, but really that’s all you need. Did you know that Metro offers free, regularly scheduled docent led group tours of the artwork in the Metro Rail system? Plan your visit at their official site. Imagine an entire house covered floorboard to roof beam entirely in tiny colored tiles. Robert Hemedes of Atlas Obscura calls it like “walking into a coral reef.” We’ll just say that the Mosaic House in Venice is one of the most unique living architectural / art installations in the entire L.A. area. An all volunteer run archery range with FREE classes every Saturday Morning. Get in touch with your inner bowman. 28. Walking along the Great Wall of L.A. This incredible mural runs over 2,700 feet long (one of the longest in the world) and illustrates California history from 20,000 B.C. to 1984. It was recently restored and is more vibrant than ever. Hike down a cliff side in San Pedro and see the wreckage of a beached ship from more than 50 years ago. When school is in session they offer a free, open to the public astronomy presentation called “Afternoon with the Stars.” You can check out the schedule here. 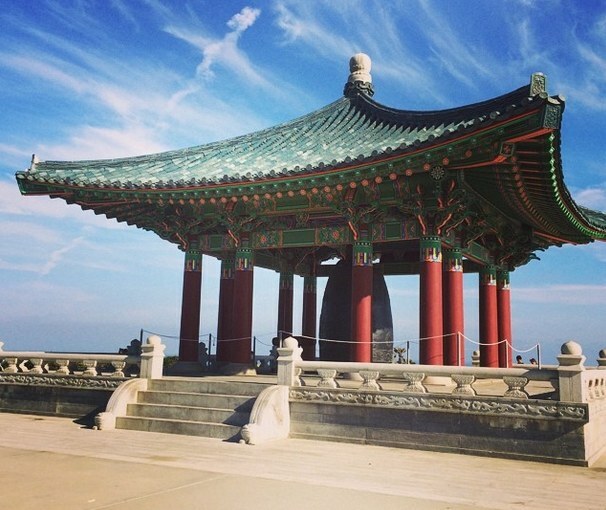 The Korean Friendship Bell is the perfect place to place to hang out, enjoy the view, and take some gorgeous photos on a sunny afternoon at a park by the sea! A great workout and a great view at the top. The Zocalo Public Square is non-profit ideas exchange foundation that offers a free lecture series where you can go to get informed about the issues of the day and discuss them in an open forum. Every summer KCRW comes out of the studios and into communities across L.A. with a series of outdoor shows featuring live band performances and DJ sets. Amoeba Records is a Sunset Blvd music store that hosts boatloads for free concerts, DJ performances, and artist signings. It’s a unique space that’s worth checking out at least once. Check here for upcoming shows. One of L.A.’s best improv comedy troupes offers a free performance every month. You just need to show up earlier enough to make sure you reserve a seat (no reservations taking for the free shows). Check out their full calendar here. Did you know every month puts on free recitals that are open for public attendance (all you need to do is make a reservation online). If classical is your thing, these might be right up your alley. Event listings on their official website. Some call it the ‘original’ big name gallery in Culver City. This is the first place to feature Takashi Murakami and Yoshitomo Nara (and if know who those artists are, this will no doubt seriously excite you). A summer-only farmer’s market with an absolutely stunning view. The produce you pay for, but the perspective on the city is 100% free. Please let us know if you have any corrections, annotations, additional tips or feedback in the comments below. Thanks! Want More Ideas for Things to do in L.A.? Sign Up For Our Email List! Two emails a week, Monday AM and Thursday AM. Monday: The best of the week ahead. 20 to 30 ideas. Thursday: What to do this weekend. 20 to 30 ideas. PLUS: Updated info on giveaways, promos, and events (like hikes and happy hours). Basically, just think of us as your friend making some fun suggestions for what you might like to check out this week. Sign-up in the form below to join the list! Remember, we respect the fact that you’re trusting us with your personal info and will never share your email information. That said, hope you come along for the ride! 🙂 Cheers!